SUNGAI KOLOK, Thailand — A bomb hidden in a car exploded at the scene of an earlier bombing, killing a reporter and a rescue worker responding to the first attack and wounded 30 other people in a southern Thai town bordering Malaysia, police said Friday. The blast took place in Sungai Kolok about 20 minutes after police, reporters and onlookers were lured to the scene Thursday night by an earlier, smaller bomb on a motorcycle that exploded without hurting anyone, said police Maj-Gen Saritchai Anekwieng. 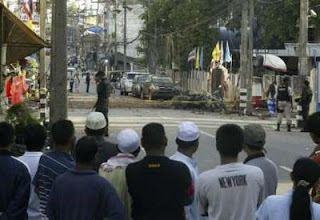 The tactic is common in bombings in southern Thailand, where the blasts are usually attributed to Muslim separatists who have been carrying out an insurgency against the government for almost four years. Thai TV Channel 9 said one of its reporters was seriously injured in the blast and that the slain reporter worked for the country's biggest newspaper, Thai Rath. Also among the wounded, who included civilians, was the town's police chief, police said. Chakrit Chalardwanakit, a rescue worker from a local charity, died of his wounds Friday, Saritchai said. The bomb on the motorcycle, which was parked across from a restaurant, exploded at about 9:30 p.m. (1430 GMT), and the car bomb about 20 minutes later. The powerful bomb damaged buildings and vehicles within a 50-meter (50-yard) radius of the blast, police said. 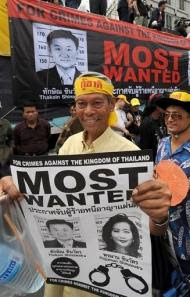 More than 3,300 people have been killed in Thailand's predominantly Muslim southern provinces since early 2004, when a separatist movement flared after a lull of more than two decades. The government has made little progress in curbing the violence despite the presence in the south of nearly 40,000 police and soldiers. Drive-by shootings and bombings occur almost daily. More than 90 percent of Thailand's 65 million people are Buddhists, and many of the country's Muslims have long complained that they are treated as second-class citizens.